Oddsmakers at Las Vegas casino Caesar's Palace aren't discouraged by the San Jose Sharks stumbling at the finish line of the regular season. Ahead of the start of the first round of the Stanley Cup playoffs on Wednesday, Caesar's gave the Sharks the second-best odds (+800) to win the Cup. The Tampa Bay Lightning, who became the second team in NHL history to win 62 games in a single regular season, is the odds-on favorite (+250). The Sharks have better odds than the Vegas Golden Knights (+1000), their first-round opponents, and the Calgary Flames (+1000), the Western Conference's best team in the regular season. That's a surprise, considering San Jose finished the regular season with a 3-8-1 record in its final 12 games after winning each of the previous six. 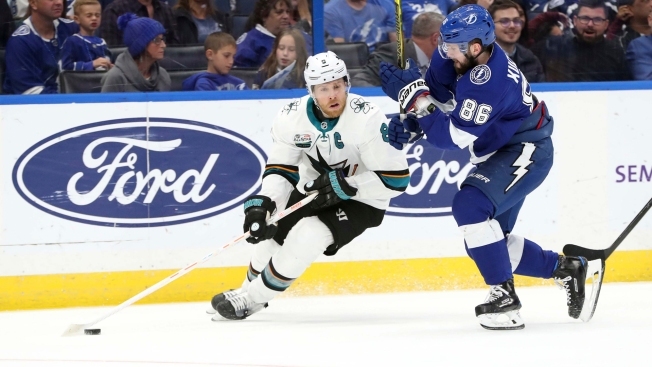 Of course, the Sharks were a bit short-handed, missing captain Joe Pavelski (seven games) and All-Star defenseman Erik Karlsson (11 games) for significant portions of the stretch run. Additionally, defenseman Radim Simek, a stabilizing presence on San Jose's blue line alongside Brent Burns, missed all 12 of those games. Still, the Sharks at their best arguably were the second-best team in the NHL. From Dec. 1 until March 12, San Jose rattled off a 31-10-3 record (65 points), which was second only to Tampa during that time. The Sharks' 5-on-5 play was particularly strong, and San Jose ranked no worse than fourth in controlling shot attempts, shots, scoring chances and high-danger chances at full strength. Pavelski and Karlsson are now back in the lineup, which could go a long towards rediscovering that form. Otherwise, the Sharks' slight edge over the next crop of contenders -- Calgary, Vegas, Boston, St. Louis and Winnipeg are all +1000 -- won't end up meaning all that much.